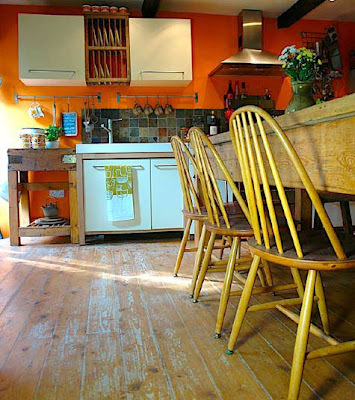 honey & jam | recipes + photos: My design...style? I've been tagged by Hillary at The Gleam of Rose Tea to find one picture that demonstrates my design style. This is a hard one for me, seeing as how I don't really think about it all that much. Because if I do it get all flustered and want to redecorate immediately. So I had to take some time, look around and really think about it. I like homey things. I don't like houses to look like you can't live in them, sit in the chairs, or cook in them. So when I came across this picture from Design*Sponge, it really struck a chord with me. The chairs! The floorboard! Oh, the floorboards. I really wish I had those in my house. I love the vase on the table too. And that little table at the end of the counter. And the towel hanging on the cabinet! You get the picture. haha Of course I would pick a picture of a dining room/kitchen, since that's the first room I tend to look at in someones house. Now, please don't be fooled into thinking that any room in my house actually looks like this, they don't, but I would happily decorate them like this. And sadly, I'm not going to tag anyone. Because I'm so bad at it! But if you'd like to participate, feel free! By the way, thanks for all your great suggestions for breads to try in my last post. I can't wait to try some out! Ooo la la. You picked a gorgeous photo. A good friend recently told me about Design*Sponge.... I am utterly in loveeeee. Hello! My name is Moriah. And I think you have a very cute blog. I also think you are a great photographer. I LOVE YOUR BLOG!! I am definitely going to follow your recipes. I am so glad I found it and your photo are amazing! What type of camera do you use? Those floors are heavenly aren't they? I stumbled across your blog entirely by accident, but I'm so glad I did! It's nice to meet a fresh face. You're on my "Relishing..." list for this week! That kitchen totally floats my boat, too! Oanh, I use a canon digital rebel xt. and Thanks!